Sometimes this blog focuses on woodworking history, sometimes on woodworking technique. Sometimes I write about interesting things I have seen. Today I am writing about the mechanics of the business. While it is my great pleasure to research and explore woodworking - I just started a new research project which has totally invigorated my interest in furniture (more on that another time) - the thing that actually takes up a lot of my brain space, especially this time of year, is wondering if the company is doing a good job. Why are you shopping with us? Will you continue to shop with us? Are we doing anything that will drive you away? We get asked all the time why we sell or don't sell certain items. And some customers notice that many of the things we sell have a fixed price that is the same as the price Amazon and other dealers use. This "MAP" - Minimum Advertised Pricing - is a technique used by manufacturers, especially in the age of e-commerce, to make ensure that the a couple of on-line vendors don't lower their prices so much that all the other retailers drop out. Retailers are not allowed to sell a regular product below the manufacturer's stated MAP price; if they do, the manufacturer will sanction or drop them. When TFWW first started, MAP pricing was pretty rare. Now it is more common. Without MAP, we rarely take on a new maker. We can't afford to. Why do we love MAP? Basically, MAP encourages retailers to compete for customers based upon the full package. That is, the things that we try to offer as our basic business mission: service, comprehensive stock, expertise, pleasantness and convenience. As many of you know, we started out as a hand tool retailer, and the real reason we started selling Festool is that we were enthusiastic users of the tools ourselves. Once we started selling Festool, we quickly realized that most of our customers who were professionals who needed their tools right away. For our customers in the Tri-State area and beyond (Rhode Island, Massachusetts, Maryland, Eastern Pennsylvania), we could deliver tools the next day. Most of the US east of the Mississippi River could get delivery within 2 days. Dave, our Shipping guy, takes his job seriously and makes sure that if we can ship today - order by 3 pm EST or a smidgen later - we will. Festool orders over $50 ship for free anywhere in the US. Our enthusiastic use of Festool means that you can call us any time and speak to someone who is a Festool user - someone who has practical experience with the tools. We ourselves are curious about how Festool tools can solve project challenges, and we're always happy to offer guidance to our customers. It's also a point of pride for us that we will handle 30 day returns and both warranty and out-of-warranty repairs. If you are buying into a high-end premium brand like Festool, why not take advantage of the brand's premium features? This Saturday we're going to have another Festool Fest, our homegrown alternative to the Festool Roadshow. 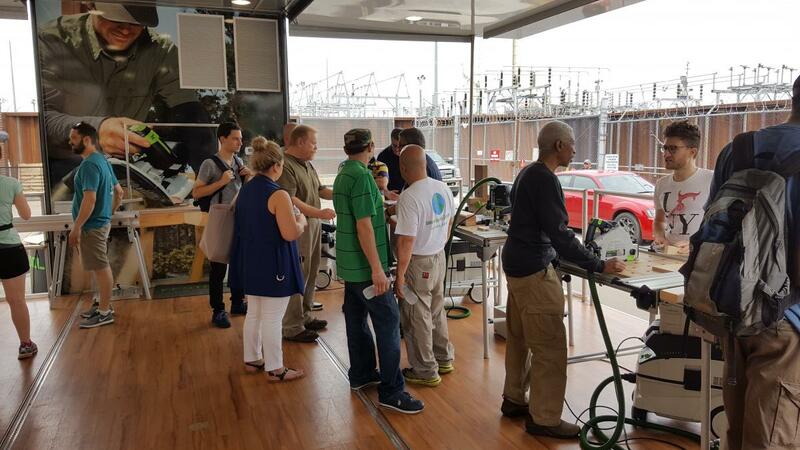 We've hosted the Festool Roadshow (see the picture above), and we realized we can offer all the benefits of the Roadshow - Festool and Festool-trained staff making non-stop demos of the new and classic tools; Festool swag; show discounts; and refreshments - even when the Roadshow is skipping NYC. So no truck, but we're especially excited about the new Cyclone. And if you were curious about some of the newish Festool innovations like Granat Net but never got around to checking it out, come on down. Festool Fest is a great opportunity to get the tools in your hands and even get to give Festool staff some feedback. MAP is just one form of retail price maintenance. Festool could not do this in many places. This would be illegal in Germany and the European Union and was until sometime in 1990s illegal in the USA. In practice it was never meant to benefit consumers. I know a lot of people dislike festool's pricing, or the fact that they can't get a "deal", but we all know competing on price is a race to the bottom, for both the manufacturer and for the retailers. It is expensive for retailers, and for festool, to keep in inventory of all the random accessories that make the system work. The only way to make it all worthwhile is through a protected margin for the dealer. I suppose that is why Bosch, who make a lot of similar tools, never put the whole system together. They'd rather compete with DeWalt (who, in my opinion, make awfully good tools for the money). Good luck finding a router edge guide, dust collection shroud, or alternative pads for your bosch sanders. They are out there, somewhere, but awfully difficult to locate. What is special about Festool? I admit to being a Makita user, and I don't see any advantages that would lead me to purchase Festool over Makita, and I see a primary disadvantage to doing so: availability of parts, accessories and service. Before retiring I sold Festool and visited the company in Germany. They do strive to provide the best tools. Sometimes the miss the mark but most time they succeed. I remember in the 1970s and early 80s we had 5 hardware stores within a few mile radius of where we lived. Each specialized a bit which benefitted them all. Then along came Home Depot and the small excellent hardware store disappeared because of much lower prices. I love MAP as it helps the little guys survive. I'm a professional user building custom furniture and have used Festool for over 25 years. I agree with the mixed comments I saw in your blog regarding price and qualaity of Makita vs Festool. It all boils down to what your using your tools for, and how you use your tools. I've had executive positions with Husqvarna Lawn & Garden, and Miller Welders so I understand both sides (the end user and the manufacturer). On my way to Festool I was a Fein user. There is a huge difference in a Fein multi tool and a Ryobi and others in between. Anti vibration is one of the key differences. Festool has this important end user benefit, and with their system approach they become unique in the way they organize and store. I do have to say however that I'm not impressed with the quality of the systainer systems. Unlike the tools themselves the value is not there. When it comes to price I like the fact that the price is universal. Ask yourself "when is the last time you felt good about your car purchase regarding price"? You sometimes find that your friend or neighbor got a better price and it makes you feel like an idiot. It also affects resale value. Lie Nielsen and Festool have the best resale values on line. Try that with DeWalt. It seems there is a price hurdle that one has to jump to get that first Festool tool. After that you then understand the difference. Also European manufacturers have a learning curve in how to market in the US. I saw this with Husqvarna, and have seen the progress with Festool. The key to that is living in the field and learning about the end user, and how they use their tools. Keep growing Festool and please do something about using a stronger material in your systainers.